Fly fishing for trout in the Andes: an exotic fantasy was about to become reality with a week of fishing on Chile's Rio Puelo. I boarded an Aerolineas Argentina 747 for the 12 hour flight to Buenos Aires to begin a fly fishing trip to Rio Puelo, Chile. Once I landed in Argentina and after clearing customs, I was back on a plane headed for Bariloche where I met my host and guide, Kent Schoenauer. Kent and I traveled another hundred miles by car to El Bolson before continuing on by boat. Kent’s boat was equipped with a jet so it could handle the rapids encountered on the way to the lodge. Without the boat it was a 7-hour horseback ride to our destination. When we docked at Kent's Rio Puelo lodge we were greeted by Cachito, his cook and all-purpose helper. It was hard to believe that 30 hours had passed since lunch in Vineland, New Jersey. The Puelo River drains from the Andes to the Pacific and is a fly fisher's paradise featuring rapids, feeder streams, waterfalls and crystal-clear water. 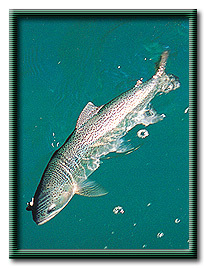 The area is loaded with trout, originally introduced by British fishermen a century ago. They have flourished and grown enormous; they fight tenaciously and spook easily. One day while preparing to wade the river, I asked Kent, "What's that stream up there?" He replied, "I've seen fish in it when I crossed it on a horse. "Has anyone ever fished there?" I asked. "I don't think so," he said. "Maybe a local Chilean used a worm in the big pool at the base of the waterfall." The next day we put on waders and took the boat to the mouth of that stream. I was about to become the first fly fisherman to present a caddis to its wild Patagonian trout. A fish was feeding in the first pool, only 100 yards away. The flow was fast and shallow enough to wade. My 4-wt. fly rod was ready for business. I stripped a little line, false cast twice and presented the fly in the middle of the rip. But no fish rose to my fly. I moved forward another 15 steps. 'Watch yourself," I thought. "This water is moving." It was so clear that depth perception was deceptive. I was standing waist-deep and could still read the label on my boot. I cast again, with no success. Then I directed my fly to the middle riffle. As my caddis fly landed, the water promptly exploded. A rainbow was on and jumping. Half the fight seemed to be out of the water, swirling, tail dancing, walking on its tail, trying to throw the hook. "The leader is light. Be careful!" said Kent. "Would the 4X (6-pound test) hold or snap off" I worried. I soon eased the fish into the net and removed the barbless fly from his mouth. Saying thank you, I gently released him into the stream. In the next two hours I landed 10 more rainbows, but many more had risen to my fly. There were fish in every pool and every large riffle. Evening light was descending in the Andes as we trudged slowly back to the boat. The brightness of the snow fields and glacial peaks illuminated what was left of the day; shadows in the valleys and across the stream were darkening. "You were the first fly-fisherman to cover that water," I thought. Then I realized there were another hundred such places for future day trips from this lodge. After breakfast on my last day, we decided to hike up to the Chilean frontier post and get the passports stamped before fishing. Conversations with soldiers and photographs took longer than expected. We didn't get back to the boat 'til noon. The wind had died. The only visible clouds were on the mountain peaks near the snow fields. The sun was strong. "We have about an hour," said Kent. It was December 31st, an early summer afternoon on the Rio Puelo. I tied on a stone fly imitation, then switched to a caddis. The fish didn't seem interested. "Try that black woolly bugger with the green stripe," Kent advised. I cast to the little pockets around the rocks, in between openings in weed beds, against some stone formations and at the base of the small waterfall. Although fish came up, none did anything more than look. It was now 12:30 and I still hadn't landed a fish. "'The green stripe is scaring them away," suggested Professor Kent. He was right. A smaller black woolly bugger without the green stripe had the right chemistry. On the second cast, an 18-inch brown took line and headed for deep water. "That's lunch!" I said. Ten minutes later, he was in the net. Kent then positioned the boat near a rocky formation and I stripped off about 60 feet of line. On the fifth cast I placed the woolly bugger in a notch formed by eons of wave action and water erosion. A rainbow took fast, leaving me barely time to set the hook. I had a lot of line out and it wasn't that tight. Fortunately, a strong lift on the rod and a newly sharpened hook point held him. This one was really a jumper. Then a 20-inch brown followed the woolly bugger out from a rock edge. "Strip faster," said Kent. Something in the twitch teased the brown. In short order we had three trout in the boat. By 1:30, we were back at the lodge, looking out the window at the beautiful views of the Rio Puelo and the Andes Mountains. Cachito prepared the filets in a light batter and quickly fried them. What a delicious way to welcome the New Year.